I’ve had a hard time writing this week. It’s not that I haven’t had things to write about, it’s that I haven’t been sure how to transition from my last post. My writing is typically pretty light and happy, but because of recent events, things have been a bit heavier here at The Daily Doss. New updates are still developing, but for the most part, things have pretty much returned to normal around here. Businesses are reopening, and the memorial is continuously growing. And to make things even better, Spring has finally made it to Boston. The trees are budding and flowers are blooming. Farmer’s markets are set to open next week, and our calendar is already full with Spring events. It was a long winter. I am glad that it’s finally over. Before the bombings took place, I had intentions to share pictures and stories about our day watching the race. Living right on the marathon route, we made a repeat of last year and hosted our second annual Boston Marathon watch party. Friends showed up early on Monday morning eager to cheer on the racers. We sipped on mimosas and snacked on homemade donuts and alcoholic fruit (fruit injected with alcohol- best. idea. ever.). We were all having a great time. Happy and in good spirits, oblivious as to what the day would later bring. So, in light of the good times that were had on Marathon Monday, I thought I’d transition back into happier topics by sharing a recipe. A recipe that we delighted in the morning of the race. A recipe that only few of us got to try as it was too good to leave any for the others. I saw a recipe on Pinterest once for homemade donuts made with biscuit dough. Brilliant, I thought. I couldn’t wait to give it a try. Well, to my disappointment, it was one of those false links that led to a dead end. No donut recipe for me. Well, it wasn’t hard to figure out, really. All a donut is is fried dough with a hole in the middle. I’m typically one who enjoys making things completely from scratch, if I can. Biscuits are no exception. I’ve made homemade biscuits a handful of times. Well, because I wasn’t sure how crazy things would be on the morning of the race, and because Whole Foods sells delicious biscuit dough, I thought I would save myself heaps of time and use this little short cut. No shame. These donuts are just too good for that. Start off by separating your biscuit dough. Then, using a circle cookie cutter, or some other circular object (I used the lid of a medicine bottle), cut holes in the center of your dough. Set aside. In a cast iron skillet or other heavy frying pan, add about 1 inch of frying oil. I used shortening as it was all I had on hand, but I am anxious to give these a try using coconut oil. Heat your oil over medium heat until temperature reaches around 350-365 degrees. Be careful not to overheat your oil. Ideally, using an oil thermometer is best, but you can get by without one (I did). If you don’t know how to tell when your oil is ready without a thermometer, there are several good resources on the web. The wooden spoon technique listed here is a good one. Once your oil has reached the appropriate temperature, in batches, carefully place your dough in the oil. Cook for about 1-2 minutes, or until golden brown, and then carefully flip, cooking 1-2 minutes more. Be careful not to overcook your dough. These will brown quickly, so don’t let your attention wander. Once golden brown, with tongs, remove your donuts and place them on a cooling rack placed over paper towels. 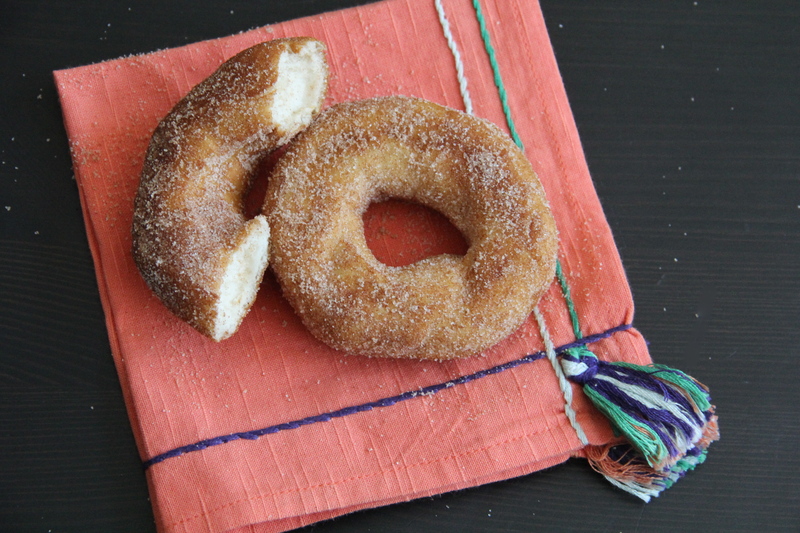 Once your donuts have cooled slightly, toss them in your cinnamon and sugar mixture, one or two at a time. I used a Ziploc bag for easy cleanup. 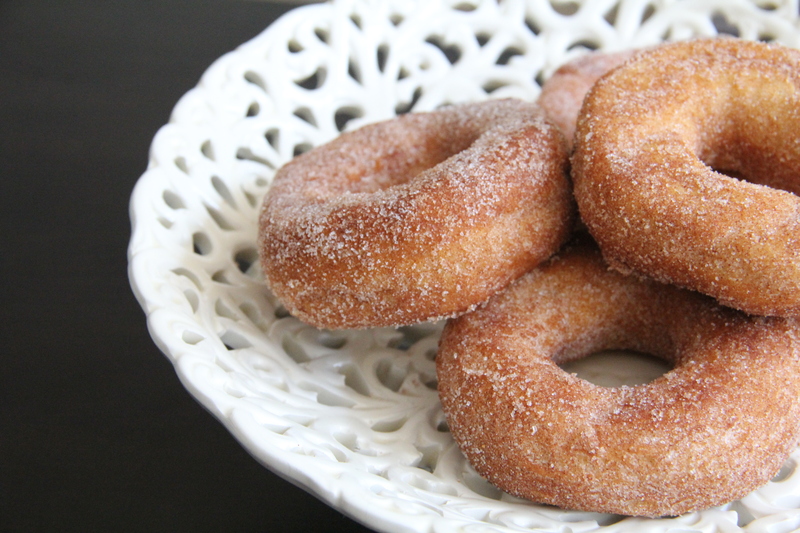 Recipe produces eight donuts and eight donut holes. Eat them fresh, or save them for later if you have the willpower. 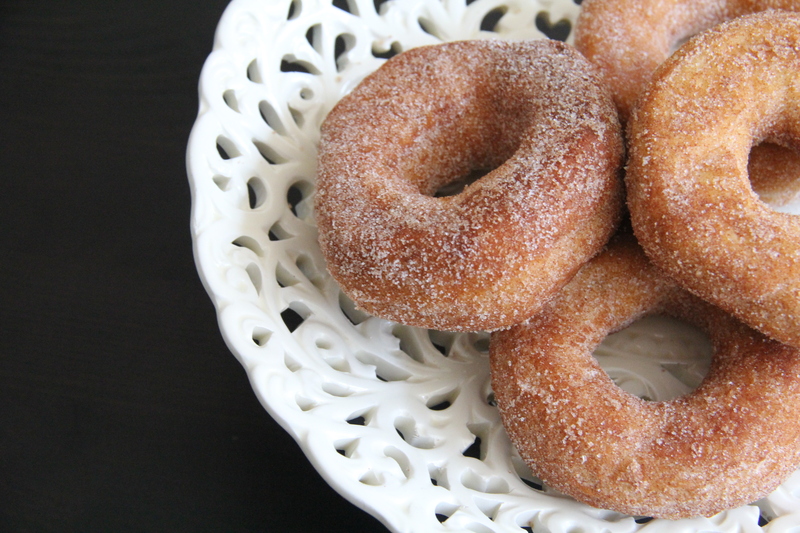 But really, what’s better than a donut fresh from the fryer?